Serious about finding a meaningful, long-term relationship? Check out Chemistry.com, an innovative site based on the core ideas of compatibility and chemistry and years of research into attraction and connection. Chemistry's profile creation process is unique, and matches you with potential dates who are tailored for you on a deeper level. To find out what this service provides you can check out our complete list of Chemistry.com features. How Chemistry looked before the update. It looks like on May 3rd 2017 Chemistry.com was completely redesigned and switched over to a new version of the service. This redesign not only affect the look of Chemistry but the features as well. 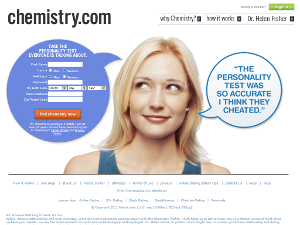 Chemistry which is part of the Match Group of online dating services was originally designed as a personality matchmaking service similar to eHarmony. With the original version of Chemistry you could not search through all members of the service using your own search parameters, you could only search through and communicate with the matches Chemistry assigns to you based on their matchmaking algorithm. The matchmaking algorithm used was very complex and designed in part by the relationship expert Dr. Helen Fisher. Unfortunately Chemistry.com had seen it's popularity wan over the past few years which is why we assume they decided to do a complete service overhaul. 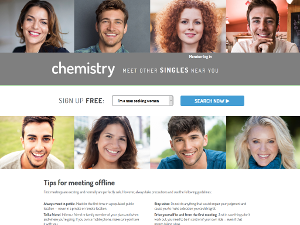 The new version of the online dating service Chemistry.com appears now to be run by People Media (which is owned by Match Group). Which means that there’s a higher likelihood of the two of you falling in love and living happily ever after, right? The reasons behind this conclusion are varied, but the basic idea is that chemistry between two people is highly variable. Just because you might match up well in theory, (and online), doesn’t mean that the spark will exist in real life. But the dating sites want you to believe otherwise. There is an argument to be made that people who are considered “compatible” or who have the same background, communication style, or any number of factors in common might make better matches. And they might – or they might not. According to one very prominent study from 2012 conducted by Northwestern University’s Eli Finkel on the matching algorithms used by online dating sites, there was just as good a chance that someone you meet at random could end up being the love of your life. According to Finkel’s study, relationship success depends on three things. First, individual characteristics, like whether you’re smart, funny, consider yourself beautiful, or avoid commitment at all costs. Second, the quality of interaction between two people - specifically how you hit it off in-person, not through text messages back and forth. And third, your surrounding circumstances, like your career, ethnicity, financial security, and health. As we know from online dating sites, we aren’t always accurate or truthful when we are describing ourselves, so it’s likely we aren’t as compatible as we think. Another problem is that compatibility isn’t the marker of a good relationship. It really comes down to that elusive thing called chemistry and how you interact together in person. The dating service Chemistry is having a 3 day free communication event starting Friday May 1st and running to the end of day on Sunday May 3rd, 2015. These events allow new and existing members to receive matches and communicate with those matches at no cost. 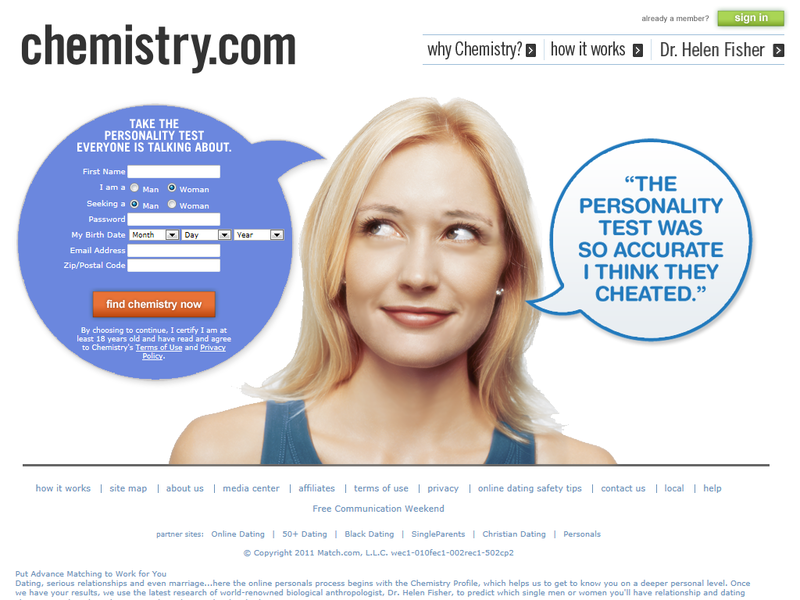 If you haven't heard of Chemistry before it is Match.com sister site. What Chemistry focuses on is long-term relationships. and it has a unique match making system that was designed in part by the relationship expert Dr. Helen Fisher. IAC released its Q4 2014 financial results at the beginning of February, reporting a 9% decline in profit for the fourth quarter from last year. Though revenue growth was in double digits, it was offset by higher expenses that ultimately led to the decline in profit. On the plus side, both revenue and adjusted earnings per share for the quarter beat analysts' estimates. IAC has released its first quarter 2014 financial results. All in all, the company reports $740.2 million in revenue for Q1 2014, more or less on par with the $742.2 million in revenue of Q1 2013. Websites revenue increased thanks to the acquisition of the “Owned & Operated” website businesses of ValueClick (which the company acquired in January of this year), the contribution of CityGrid Media, and growth at About.com. On the other hand, applications revenue decreased, primarily due to lower queries in B2B. Adjusted EBITDA decreased as well, as a result of lower revenue in B2B and higher marketing expense in B2C. The Match Group – which includes Match.com, Chemistry, People Media, OkCupid, and other dating businesses – saw 9% growth in dating revenue (broken down into 7% growth in North America and 12% growth in International). Non-dating revenue grew 53%. Despite the higher revenue, driven mostly by increased subscribers, IAC’s profits declined due to a significant increase in marketing expenses for certain businesses. Dating revenue for North America totaled $134.5 million in Q1 2014, up 7% from $125.6 million in Q1 2013. International dating revenue jumped 12% to $70.5 million in Q1 2014 from $63.2 million in Q1 2013. Combining both, IAC’s total dating revenue for Q1 2014 is $205 million, an increase of 9% from $188.9 million in Q1 2013. One major change that stands to make a huge impact on IAC's bottom line is the monetization of Tinder. Though IAC has declined to specify its exact ownership stake in the company, it has said that Tinder is now completely owned by IAC and Tinder executives, with CEO Sean Rad at the helm. The hugely popular mobile dating app is the hottest company in IAC's portfolio, but it doesn't yet generate any revenue. IAC has announced that 2014 will be the year that changes, though they've been vague so far about the exact way that monetization will take place. The most obvious strategy would be to run ads on the service. In fact, it wouldn't be the first time it's happened. Fox used fake profiles to promote The Mindy Project, as did the USA Network program Suits, though they did not bring Tinder or IAC any revenue and a company spokesperson maintains that the campaigns were "strategic partnerships" rather than advertising. Happily ad-free Tinder users should enjoy the experience while it lasts – with all the money-making potential the app packs, it’s probably only a matter of time before ads become the new norm. Many singles have tried at least one online dating site. Some have found success right away while others get frustrated and wonder why they decided to try online dating in the first place. Unfortunately, many people don’t know all of the options available, or one dating site might work better for them than another. There is a lot of competition among online dating sites, but most people flock to the few they know, like Match.com. But it’s important to first ask yourself before you sign up: what do I want out of my dating experience? People date for different reasons, and the same goes for online dating. Not every member is interested in finding a long-term relationship. So it’s good to ask yourself if you just want to date and have fun, or if you’re looking to meet someone special and settle down. Your intention is an important part of your dating experience. Next, you have to know yourself. Are you very shy? Are you more at ease on a date where you’re doing something together rather than sitting across the table from each other? Or are you really confident and slightly intimidating? Do you know what you want and you’re not afraid to say it? This is why it’s important to ask yourself these questions. From there, you can try a few different dating sites to see what’s right for you. If you’re looking for a serious relationship, then eHarmony or Chemistry are your best bet. They have a significant number of members to choose from, and you have to go through a pretty rigorous and time-consuming sign-up process before you can search through matches. So from the start, people on the site are a little more serious than your average online dater. But I would also suggest Christian Mingle or a niche dating site if you have particular beliefs that are most important to you when looking for a partner. Again: know yourself and what you want. I suggest trying two or three sites and seeing which format you like best. 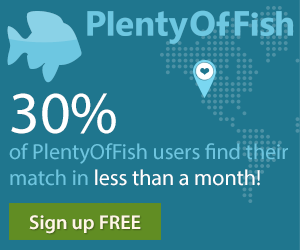 Most sites offer a free trial period so you can at least set up a profile and check matches. It’s worth the time to really look and see what’s right for you.